Hi, my name’s Monkey. Don’t you dare call me by my real name, Johnny Lovebird. And if you sing that lovebird song, I might never speak to you again. No, Johnny Lovebird does not sit in a tree. Though, come to think of it, monkeys do. 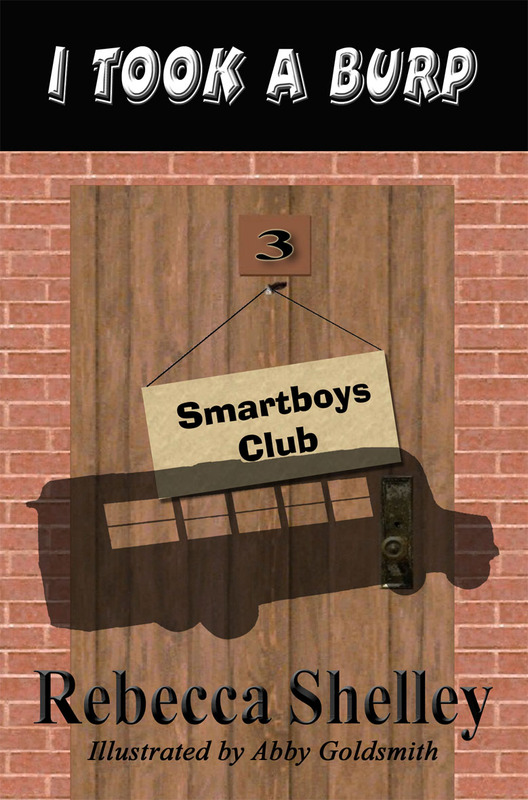 Lots of people tease me about my name, but not my friends in the Smartboys Club— Vinny, Bean, and Art. To tell the truth, Vinny, Virginia Garcia Diaz, isn’t a boy even though she’s in the club. She’s just as smart at math and English as Bean and I and twice as smart when it comes to computers. I am a genius when it comes to literature. I read really fast and remember almost every bit of it. I’m pretty good at math too, but not like Bean. Bean’s real name is Tommy Jones, and I secretly think he could show our teacher, Mrs. Red, a thing or two about math and science. Of course Art isn’t good at math or language arts, but he can make a basket every time he shoots the ball and draws space ships better than anyone. That’s why we call him Art even though his real name is Kyung-sam Gee. As you can tell there are a lot of different kinds of smarts. And we Smartboys thought we knew all the kinds until a new girl transferred into our class. Sandra Campbell wandered in one morning, and I do mean wandered. She took three steps into the room and then stopped. Her eyes were off in la-la land. She stood there and tapped her foot for a full minute and might have stood there forever if Mrs. Red hadn’t noticed her. Eric Dripp laughed. I don’t like him much. I shot both Eric and Bridget a glare. Sandra’s long red hair looked just fine even with the stray curls. 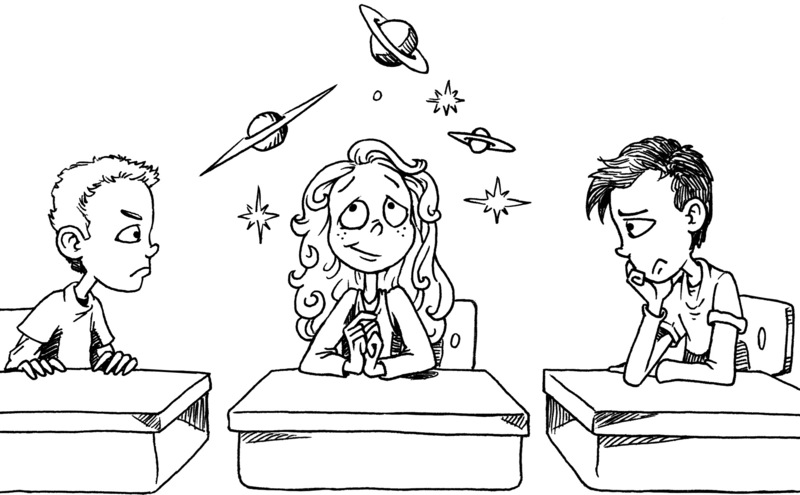 What I thought was strange was how she stood at the front of the class without blushing, fidgeting, or otherwise looking nervous about coming to a new school and being introduced to a bunch of kids she didn’t know. She just smiled, nodded at us and then at Mrs. Red and asked where she should sit. Just then our janitor, Tom Brown, came in with a desk and plunked it down in the back, right between Bean and me. Janitor Brown and the Smartboys usually get along great and help each other out, but I was still a little mad at him for killing my spider, Miss Prissy. But that’s another story. Bean and I looked at each other in shock, but there wasn’t anything we could do. Mrs. Red escorted Sandra to the desk, and that was that. We had a spacey redhead sitting between us. A Field Trip, Oh No! Oh No, I thought. That gives my mom two whole days to find where I hid my suit in a wad under my bed. The kids on the right side of the room cheered. The ones on the left groaned. I burped really loud to show what I thought of going to the symphony. I hate wearing a suit. It makes me all itchy, and a tie feels like a hangman’s noose around my neck. That would make anyone burp. In the hubbub caused by Mrs. Red’s announcement, Bean started crawling toward the pencil sharpener. One of these days he’s going to sneak all the way to the sharpener and back without getting caught. He almost made it last time, but not quite. This time he made it there, got his pencil sharpened, and headed back before Mrs. Red got the class quieted down and spotted him. “Tommy Jones. Not again.” She pointed to his seat and then wrote his name up on the board. If you get your name up there, that’s a warning. If you get a check mark by it, you have think-time for five minutes in the little desk out in the hall. If you get another mark, you have to stay in from recess and clean up the classroom. Sometimes I don’t know why Mrs. Red bothers to erase our names off the board everyday after school. Bean, Art, and I, we don’t usually try to get in trouble, but somehow something always seems to happen. We work hard to make sure Vinny never gets in trouble though. She sits with the rest of the “good kids” on the right side of the room. Sandra blinked. For a moment it looked like she might raise her hand, but then she just shook her head. While Mrs. Red continued her lecture on Bach, Sandra’s eyes glazed over, and her gaze wandered vacantly toward the window. 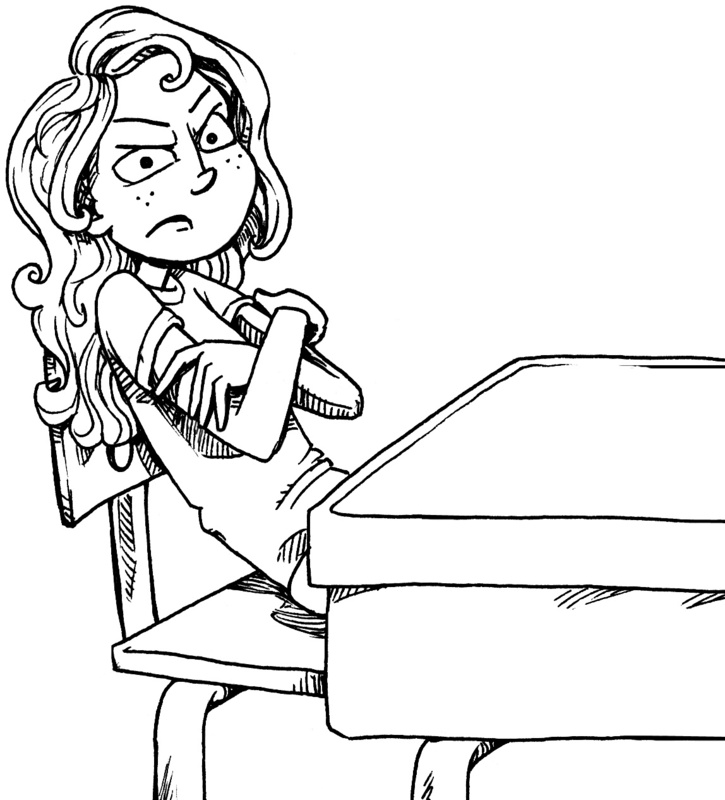 She began tapping her fingers on her desk. Bean leaned forward so he could look around Sandra at me. He mouthed something and pointed at Sandra, but I couldn’t tell what he was saying. He got out a piece of paper, wrote on it, and held it up. Oh right. Bean figured Sandra must be tapping out some kind of message in Morse Code. I listened, trying to make out specific letters, but it just sounded like gibberish to me. After a minute, Bean started tapping back to her. Sandra blinked in confusion as if Bean were speaking a foreign language. “You know, Morse Code, for sending messages across a telegraph wire like S.O.S.” Bean tapped his finger on the desk three quick times, followed by three slow times, and then three more quick taps. Sandra continued to stare at him. “Oh.” Sandra turned to face the front of the classroom just in time for Mrs. Red to say, “Isn’t that right, Sandra?” I figured Sandra was in deep trouble now, since we hadn’t been paying attention to Mrs. Red’s lecture about Bach. Bean and I just stared at each other in shock. If we’d said something like that, we’d have been in trouble for sure.